Edwin J. Weinmann celebrated his 100th birthday on Saturday, May 14 at McPeak's Assisted Living Facility in Patchogue, New York. Surrounded by family and friends, Mr. Weinmann enjoyed a slice of pizza, some red wine and a delicious piece of cake. Born in Brooklyn in 1916, Mr. Weinmann, the only child of Augusta and Edwin Weinmann, spent most of his life in Ridgewood, Queens with his wife, Ann and daughter Marilyn. One of the ever-declining remaining members of the "Greatest Generation," Mr. Weinmann served as a munitions expert in the U.S. Army from 1942 to 1945 and received several Medals of Honor for his bravery during World War II. Though he was loved by all of the building's tenants, Mr. Weinmann left his position in 1972, when he lost his wife. For 25 years following Mrs. Weinmann's passing, Mr. Weinmann visited her gravesite at Pinelawn Cemetary every Sunday, to bring her a bouquet of pink carnations. He'd come to know the florist so well that she continued to charge him the original 1972 price for his very special flowers. "We're so grateful to McPeak's for taking such great care of Uncle Ed and for providing us with a wonderful location in which to celebrate his birthday," says Ms. D'Amico. "We had a beautiful day and the staff did a tremendous job of assisting us by providing beverages and helping clean the dining room where the party was hosted." "We're honored to have the opportunity to care for a resident like Ed," says James McPeak, Owner/Operator, McPeak's, which also celebrates a milestone this year, its 60th Anniversary. "Since he is one of the 'Greatest Generation' and fought in World War II, it's only fitting that Edwin's birthday falls so close to Memorial Day. We're thankful to have someone who has sacrificed so much here with us at McPeak's." 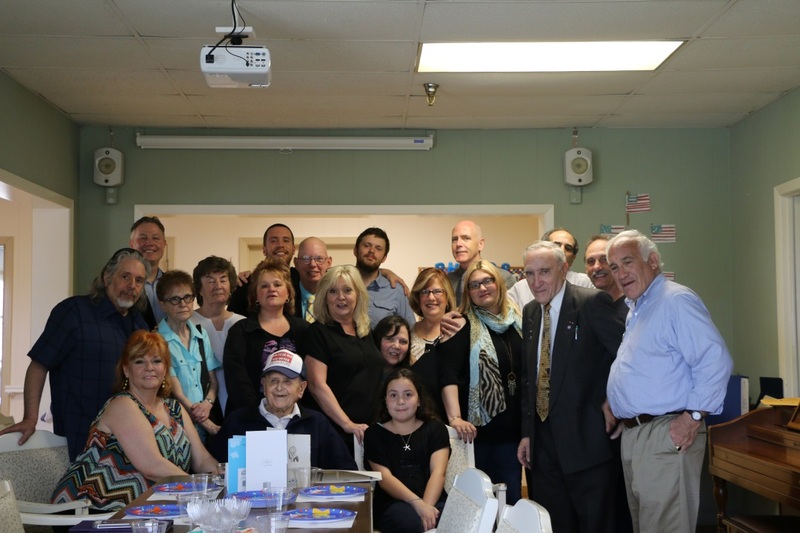 Photo Caption: Edwin John Weinmann (front row, center) celebrated his 100th birthday surrounded by family, friends and local politicians at his current home, McPeak's Assisted Living Facility in Patchogue, New York. Pictured left to right are (back row) Neil Foley, Town of Brookhaven Councilman; James D'Amico, Mr. Weinmann's great nephew; Gary Richard, Officer, Veterans Service Agency of Suffolk County; Brian Costello, Mr. Weinmann's great nephew; James McPeak, Owner of McPeak's Assisted Living; Anthony Cucinotta, friend of family; (center row) James D'Amico, husband of Mr. Weinmann's niece; Marilyn Doherty, Mr. Weinmann's daughter; Rita Kunzer, Mr. Weinmann's niece; Nancy Niester, Mr. Weinmann's granddaughter; Jackie Costello, Mr. Weinmann's niece; Connie Chillemi, friend of family; Kathryn Richard, Mr. Richard's wife and co-attendee; Cherish Chillemi, James D'Amico's fiancé; Sal Nicosia, representative of the Office of New York Senator Tom Croci; Sal Chillemi, friend of family; Paul Pontieri, Village of Patchogue Mayor; (front row) Jen D'Amico, Mr. Weinmann's niece who organized the event; Mr. Weinmann, the centenarian; and Victoria D'Amico, Mr. Weinmann's great-great niece.